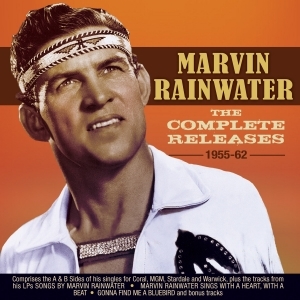 Marvin Rainwater is an artist whose roots and primary career in the USA are in the country and rockabilly market, but who had his biggest chart success with what was hailed as a rock ‘n’ roll record in the UK with “Whole Lotta Woman” in 1958. Of part Cherokee descent, which helped him shape his distinctive image and persona, he had a Top 3 country hit in 1957 with “Gonna Find Me A Bluebird” before registering his landmark success in the UK, enjoying further US country chart successes before throat problems caused a career hiatus from 1962. This excellent-value 58-track 2-CD set comprises the A and B sides of all the singles he released during the period, mostly for the MGM label, including a duet hit with Connie Francis, plus the remaining tracks which appeared on his albums “Songs By Marvin Rainwater”, “Marvin Rainwater Sings With A Heart, With A Beat” and “Gonna Find Me A Bluebird”, and were not otherwise released on singles. As such, it represents a comprehensive retrospective of the era of his career when he enjoyed all his chart success and brought him his induction into the Rockabilly Hall Of Fame.